One of Asda's non-food branches, in the John Allen Centre in Cowley. Page last edited 2012-03-30 20:02:53 (version 2). 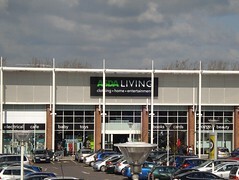 One of Asda's non-food branches, selling things like clothes, toys, homewares, and health and beauty products. It opened in May 2011 in the John Allen Centre in Cowley, replacing the Comet and JJB Sports stores that previously occupied the units. There is a café on the first floor of the shop which serves hot and cold food and drink. It has high chairs, children's chairs, and a play area for children. Last edited 2012-03-30 20:02:53 (version 2; diff). List all versions.